In light winds of 7-8 knots, the opening day of racing at the 2013 Maxi Yacht Rolex Cup, saw all the yachts dispatched on a coastal course of either 25 or 17 miles, both of which including classic Maxi Yacht Rolex Cup landmarks: a passage through Capo Ferro and roundings of Monaci and Secca di Tre Monti before returning to the finish in Porto Cervo. Today’s winners were: Alegre (GBR) in the Mini Maxi Rolex World Championship; Velsheda (SUI) in J-Class; Highland Fling (MON) in Maxi; Altair (ITA) in Maxi Racing/Cruising; Nilaya (GBR) in Supermaxi and J-One (GBR) in Wally. In the eagerly anticipated first race of the fourth Mini Maxi Rolex World Championship, the new 72ft Alegre claimed the morale-boosting first bullet. 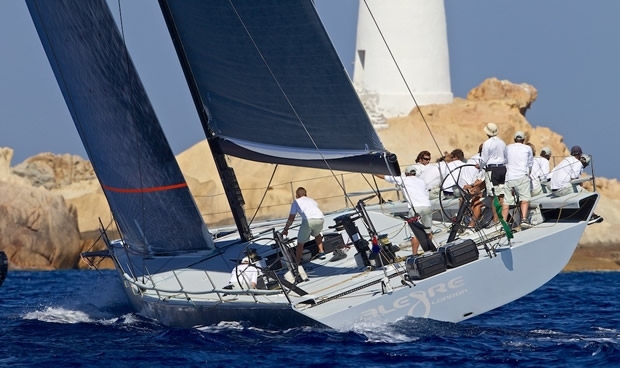 Alegre was followed by Niklas Zennstrm’s 2010 and 2011 Mini Maxi Rolex World Championship winning Rán 2 (GBR), which today finished second with Shockwave (USA) in third. Bella Mente endured a frustrating day finishing down in ninth and now has her work cut out if she is successfully to defend her title. The fleet of seven Wallys shared the same 25-nm course. Sir Charles Dunstone’s Hamilton (GBR) was fastest on the water, while former champion J-One (GBR) claimed the first bullet of the week. Among the four J-Class yachts, the 136ft Ranger has the best record in Porto Cervo, having taken the Class title in all three of her previous appearances. After a three-year absence from the competition, John Williams and his crew are in search of a fourth victory: “This is one of our favourite venues,” explained Williams. “The seas are very flat, a good venue for J-boats. However, as the biggest, heaviest of the J-Class boats we need wind to be able to sail effectively, typically 14-15 knots. The other boats tend to do better in lighter air.” So it proved in today’s light airs with Ranger trailing behind Rainbow and eventual winner Velsheda. Filip Balcaen’s 112ft Nilaya (GBR) stretched her winning run at the competition to six races, stretching back to 2011, in the Supermaxi Class. Highland Fling, Maxi Racing champion in 2011, claimed the first Class bullet ahead of Morning Glory, returning to the event after an absence of six years. Racing continues tomorrow with windward/leeward courses planned for the Mini Maxi and Wally classes, and a coastal race for all other classes.